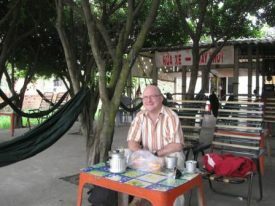 A Private Tour Guide in Southern Vietnam for Down-to-Earth Travelers! Shows you the real Vietnam — the way Vietnamese people experience it? Treats you like a friend and leads you into cultural adventures that are way cooler than you’ll find on a mainstream tour? Wants you to have fun and will do all he can to make that happen? Welcome to Phúc Yeah Tours: Adventures in Vietnam with Trần Phúc! Phúc offers private and small-group excursions, custom-tailored to fit your interests and energy level. If you want to hit the big sights, he’s happy to do that with you, but he will also show you places most guidebooks don’t even know about. One of the most fun, most local experiences you can have is to have a feast at a neighborhood goat barbecue restaurant. The Mekong Delta has a vast network of paved pathways that are great for cycling. So-called “monkey bridges” like this one are rare, but should you encounter one, Phúc will help you get across. Brick kilns near Châu Đốc in the Mekong Delta. Whether you’re in the mood for an urban adventure, or some serene exploring in the Vietnamese countryside, Phúc gets it that the reason you travel isn’t to hear over-rehearsed guides drone on about things they’ve memorized from textbooks. Those aren’t the things we remember from our journeys. What we do remember is the moments when we do something special, something different, something mind-blowing that brings us deep into the local culture. 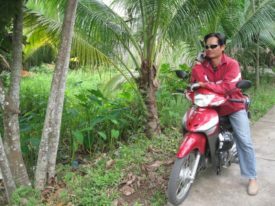 If you have more time, Phúc also knows his way around Hoi An, Hue, Dalat, Mui Ne, Nha Trang, the Central Highlands, and lots more places in southern and central Vietnam. Phúc was born in Vĩnh Kim, a small village in the Mekong Delta. He moved to Saigon in 1997 to study tourism at Hùng Vương University and received his international guiding license in 2001. An avid bicyclist, he led tours for many years for a well-established adventure travel company before starting his own business in 2011. He has an impressive knowledge of the network of pathways that link together the villages in the Mekong Delta. At times, you might wonder how he knows where he’s going … but he always does! He also loves Vietnamese mixed martial arts and soccer. (If you’re a soccer player, he might even wrangle together a group of friends for you to play with.) 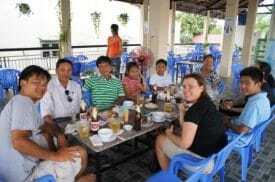 He lives in Saigon with his wife, Ngọc, and their two sons, An and Khang. While he feels energized by the lively pulse of Ho Chi Minh City, he also enjoys returning to the countryside to relax with his family. Ready to Go? Phúc Yeah! To find out more, all you need to do is send Phúc an e-mail. Let him know what you’re interested in. Be as general or specific as you like, ask any questions you have, and he’ll get back to you with an answer and/or a price quote as quickly as possible. If you’ve got a group of people that would be interested in travel writing (or personal travel journaling) lessons, or if you are looking for a Norwegian translator to accompany your group, I am sometimes available to work along with Phúc. (I speak fluent Norwegian. I’ve lived in Norway, and have studied Scandinavian Studies at the University of Wisconsin-Madison, and Norwegian Linguistics at the University of Oslo. Send me an e-mail if you’d like more information. Søker du en norsk-talende guide i Vietnam? H ei! Jeg heter Dave Fox. Jeg er amerikansk statsborger, men jeg snakker flyttende norsk og bor i Ho Chi Minh City (Saigon). Jeg har bodd i Norge, har studert norsk språkvitenskap på Universitetet i Oslo, og skandinaviske studier på Universitetet i Wisconsin. Jeg kan samarbeide som tolk med Phúc eller din egen guide om du vil ha noen som kan oversette til norsk. Send meg gjerne en epost om du vil ha mer informasjon.